Lights. Our Natural stain is the lightest and most durable oil based finish, sealed in polyurethane. Pickled white (a white color wash), and white are sealed in nonyellowing polycrylic. Pickled oak adds no color, but slightly lessens contrast. Poplar is a light wood, with light tan, pale yellow and greens and some browns in the grain. A sheer white color wash, where grain is still quite visible. Non yellowing polycrylic finish. Minwax Oil-based stain, slightly mutes the grain, with little color change. Polyurethane finish. Customer Favorite. Minwax oil-based wiping oil. Golden finish. Sealed with polyurethane. A primed and painted finish in gloss bright white with nonyellowing polycrylic finish. Golden Pecan is a light tan-peach. Ipswich pine is most popular, and is a light tan with amber highlights. Puritan pine is a little darker, deepening the grain. Golden Oak is more yellow with pronounced grain. English Oak is tan bordering on mustard colored. Minwax oil based stain finished in polyurethane. Like Ipswich pine but with darker grain. Minwax water based stain finished in polycrylic. Less amber and more mustard colored. These shades have gold or peach overtones. Scroll down further for reds. Minwax oil based stain finished in polyurethane. This is a mid-tone brown with hints of peach and lavender - the color of raw cherry wood. It is not a red finish at all. Minwax oil based stain finished in polyurethane. A lighter amber-orange brown color. Go with Ipswich Pine or Golden Pecan if this color has too much orange in it for you. Minwax water based stain finished in polycrylic. Good mid-tone brown, not too warm. Minwax oil based stain finished in polyurethane. Strong golden highlights in medium brown base. Minwax water based stain finished in polycrylic. A milk chocolate color. Our lightest peachy-tan oil-based stain. Slightly lighter and warmer hued than Ipswich Pine. Minwax oil based stain finished in polyurethane. An intense deep amber brown with strong orange highlights. Minwax water based stain finished in polycrylic. A warm golden brown, deeper than Early American by a tad. Minwax oil based stain finished in polyurethane. Slightly deeper than Colonial Maple with slightly more violet in it. Red Chestnut most closely matches what most folks think of as Cherry, in older kitchen cabinets. Red Oak is a little more red than Red Mahogany (which is darker and more violet), though both are deep brown. Sedona Red is a glorious brick red. 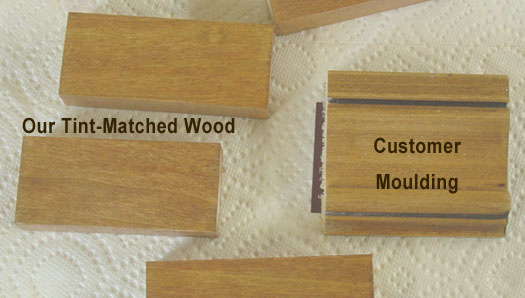 Rosewood is the most violet of the finishes. Minwax water based stain finished in polycrylic. These shades are cooler colors going well with deep browns or grey decors. Minwax oil based stain finished in polyurethane. This is a weathered grey with very little brown in it. Looks slightly greenish next to rich browns. Minwax oil based stain finished in polyurethane. A lighter grey-brown with a touch of golden highlights. Minwax oil based stain finished in polyurethane. Nice hearty brown. Cooler than special walnut. A darker slightly richer form of Provincial. Minwax Oil based. Jacobean is the darkest brown we have. A Minwax oil-based stain finished in polyurethane. An oil-based stain finished in polyurethane. Pure black pigment. It is NOT completely opaque so actual finish is a very dark brown black with a hint of grain. Unfinished interior gates should be spray painted or wiped down with an unpigmented wood oil. 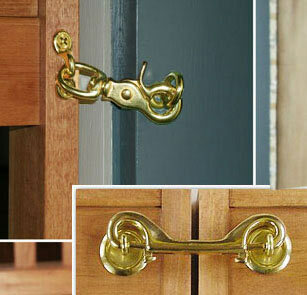 Once a gate is assembled, brushing paint or applying a stain is difficult due to nooks and crannies. Using a tung oil or other finishing oil, allowing the gate to dry, and finishing with a wipeable polyurethane is the best way to finish an unfinished assembled gate. Deck gates only ship unfinished. Seal with your choice of waterproofer. We recommend Olympic WaterGuard for Wood. Stained finishes are satin sheen bordering semi-gloss sheen. Painted finishes are semi-gloss to glossy. Available for all interior gates. Stained finishes are highly durable. Wood is pre-conditioned for no blotches. Stains are applied and allowed to dry. A sanding sealer is applied, to close the pores. Wood is sanded. Finish coats are polyurethane, multiple coats. Buffed before packing. Painted and pickled white finishes are sealed in non-yellowing polycrylic. Interior gates only. Custom painted finishes are available on assembled gates only. White finishes cost more due to priming multiple coats, sanding, painting multiple coats, sanding, and finishing in polycrylic. White finishes are available on assembled gates only. You may add a custom color to your order at checkout. 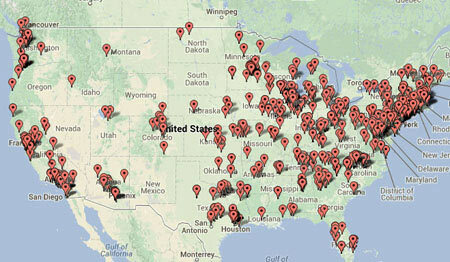 We recommend Valspar paints at Lowes. We do not support gel-based stains. There is a surcharge for the pre-mixed paint or stain. The paint or stain must be available within 20 miles of Greensboro MD, and available in quart size. To proceed, send at least one sample of wood to the address on our Contact Page, with a check for $19.99 made to HEBELL LLC. No samples greater than 9x5x1 inches, please. We prefer samples at least 3 inches long on the longest side. 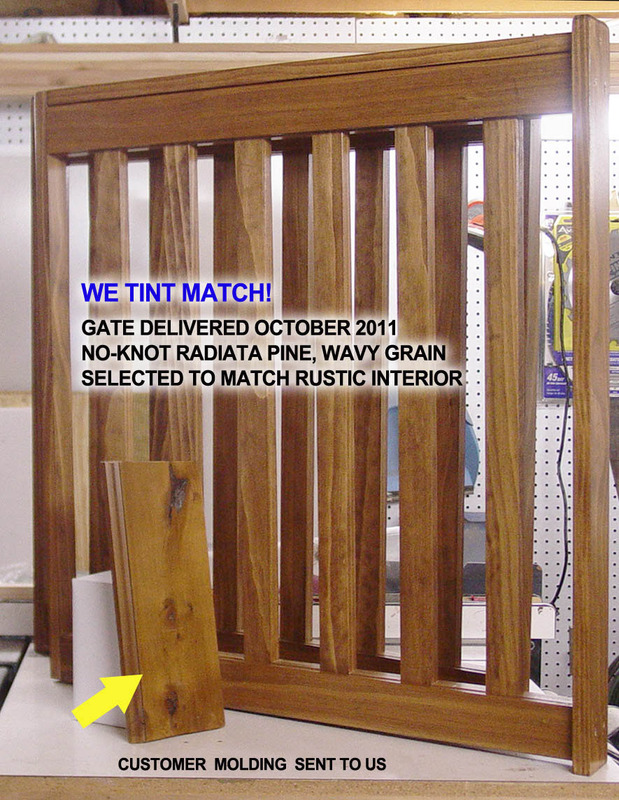 We will mail back to you several pieces of wood, tint matched to your sample. 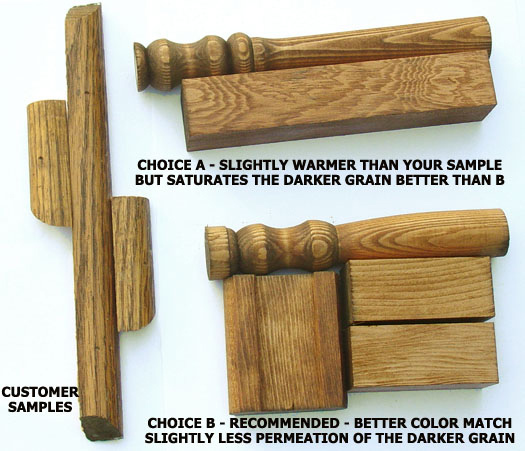 Please note we can match color, but our wood may have different grain patterns than your wood. If you proceed to order a gate, we will mail back your original sample(s) within the gate box, and credit you $10. 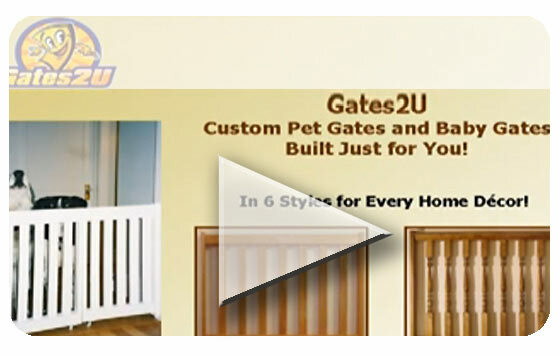 If decide NOT to order a gate, your samples will be mailed back to you at our expense. Your net cost for tint matching is $9.99 if you buy a gate!